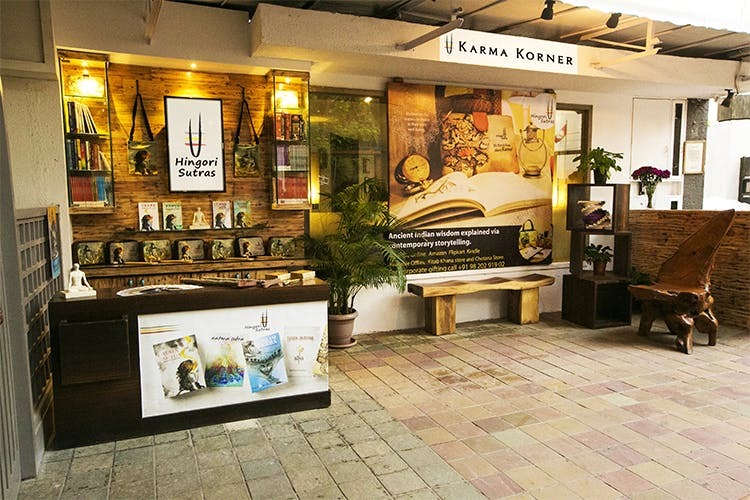 There’s a bookstore called Karma Korner in Bandra which focuses on spirituality and #goodvibesonly. It is located in Le Sutra, the only art hotel in Mumbai and takes a small corner of the space. It is a bookstore which is based on spirituality. Right when you come, if you like you could take a spirituality personality quiz, which you answer and know whether you’re an absolute beginner, slightly inclined, very interested in spirituality. According to this they then suggest which book would be right for you. We didn’t mind taking it, because we consoled ourselves that there are no right answers, and no failures when it came for this test. There are always going to be a total of 50 books available on this shelf, not more, not less – which isn’t anything really to do with spirituality but is just a fun fact. The books are across Indian and International authors, and include 3 by Hingori Sutras, the publishing division of Le Sutra. If the idea of spirituality has ever intrigued you, and you don’t mind picking up the right book for it, you should come by this bookstore. And after your dose of it, you can walk right over to Out Of The Blue for a great meal after. Win-win!